What is the power of words? Words can change the course of history. 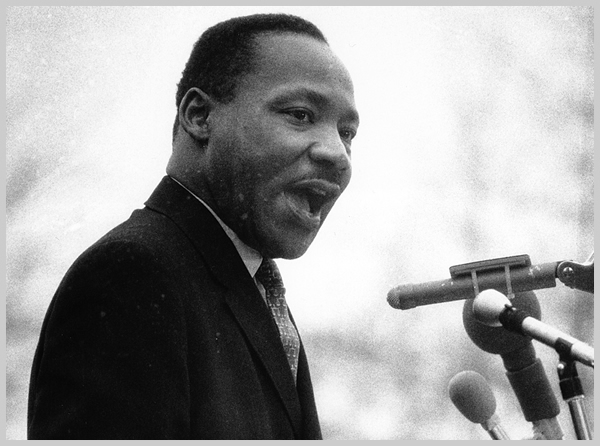 On August 28, 1963 Martin Luther King’s speech elevated African Americans from second class citizens to equals. In modern time with NSA spying and the Patriot Act freedoms of all Americans are in jeopardy. Like in 1963 when MLK said, “In a sense we’ve come to our nation’s Capital to cash a check. When the architects of our republic wrote the magnificent words of the Constitution and the Declaration of Independence, they were signing a promissory note to which every American was to fall heir. Just like MLK I do not think the bank of justice is bankrupt. The modern currency is self-sufficiency. Government is the problem, but half of the country relies on her for their needs giving up the life, liberty, and their pursuit of happiness. I pity these people. Our country is in desperate need of leadership. We need another MLK or Winston Churchill. In the age of Social Media the opportunities to become that leader is never easier. For those seeking to lead from the words of Churchill, “Never give in, never give in, never, never, never.” Do you have what it takes to lead? Welcome to Freedom Farm TV. Welcome to Freedom Farm TV.. Welcome to Freedom Farm TV. The path to freedom through self-sufficiency and self-reliance is a difficult one. Like the old saying goes Freedom is not free, sweat equity is required. Taking responsibility for yourself and that of your children is very scary. In the age of debt, pills, and cradle to grave care by the government true freedom is not experienced. For five years now my family and I have been working on increasing Financial Freedom by becoming debt free. The Borrower is slave to the lender period. You borrow money to buy a car. The bank requires certain type of insurance, full coverage instead of just liability. You borrow $25,000 but must pay much more back to them. In both cases your financial freedom is lessened. My family follows Dave Ramsey’s debt snowball method to clean up debts from the past. Staring with the smallest debts first working up to the largest last is a sound game plan. By the time you get to the largest you have more traction attacking that debt. Now that we aren’t swimming in debt any longer we can now focus on our homestead. With Permaculture design techniques I have planned out my property to provide the food for my family. Goats, chickens, and pigs will provide the protein while annual and perennial fruits and vegetables will provide the carbohydrates. The plan is to phase this in over the next few years. Currently I have two dairy goats (a buck and doe breeding pair) hopefully will provide enough milk for cheese making and meat from the offspring. I have 21 chickens (14 meat birds, 6 egg layers, and one rooster) that I tractor through my property. The birds increase the fertility of my soil by their waste. Also, they consume insects like ticks and such. Taking responsibility for yourself and that of your children is not an easy task. Normal today is to toward government for their needs. Government is not the solution. Government is the problem. Ask yourself have I increased my self-reliance? Pastured Poultry is a great starting place towards Self-sufficiency. I have currently have 21 chickens ( 14 meat birds, 6 egg, and one rooster). I had the egg layers free ranging though my property, then I had 11. Everything was fine until a friendly neighborhood hawk decided to feast on 4 of them in one week, so into a coop they went. After confining them I notice a change in the eggs. Instead of the bright yellow yokes, I had eggs that look a lot like the ones that came from the store. The change in diet from grazing on just about everything to just feed from the farmer’s supply made my beautiful eggs into dull nutrient lacking eggs. This is where the chicken tractor comes in. A chicken tractor is a mobile coop. I built mine from materials I had left over from other projects. 3 2×8’s make the frame( about 4’x8′) and 4 equal size sheets of 4 foot fencing make the rest. Two sheets loop from one of the long sides of the frame to the other hoop style, the other two on each end. The cut out a square for the door, attach a chain to move it around, and you have yourself a chicken tractor. I have two tractors one for meat birds and one for the egg layers. I move them twice a day morning and night. The many benefits are as follows: the need for less feed, less grass that needs cutting, and fresh fertilizer. Chicken tractor is a very good Permaculture technique to increase productivity of your land.